Property owners often confuse property taxes and assessments. For instance, some taxpayers attempt to "grieve" their taxes. You can grieve your assessment, but not your taxes. Assessments not taxes - are determined by local assessors. Taxes are determined by school boards, town boards, city councils, county legislatures, village boards and special districts. These jurisdictions are responsible for taxes, not assessments. If you feel your assessment is too high, you should discuss it with your assessor and consider contesting your assessment. Your assessment can increase and your taxes can decrease (or vice versa). 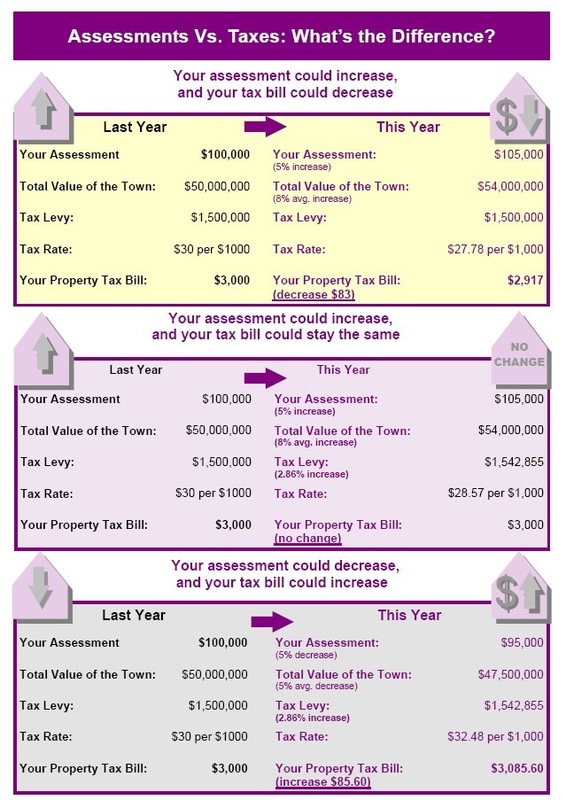 The scenarios below illustrate how taxes and assessments can move in opposite directions. If you believe your assessment is fair but your taxes are too high, you may wish to bring your concerns to your local elected officials.